After the HUUUGE success I experienced with my cauliflower crust pizza marinara and cheese pizza, I felt the time was ripe to try something new involving cauliflower crust. As I was making up my mind, the other day - on my way back from the gym - I walked by a pizza parlor and noticed some pretty good looking calzones in the window. That’s when it hit me: cauliflower crust calzone! Rad. First of all, let me say this: it’s not complicated at all to make these calzones. It’s also really quick, which is a nice bonus. As with cauliflower crust pizza what really matters is to squeeze out all the moisture from the cauliflower rice. It’s mandatory and non-negotiable to get a perfect crust. 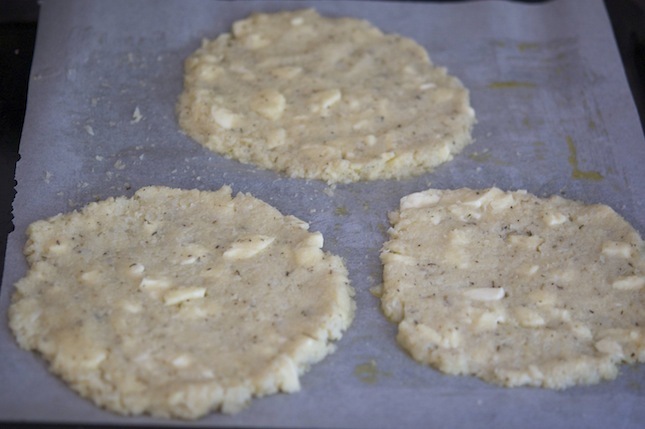 Once you get the cauliflower dough ready you need to shape it into three round disc. 10 minutes in the oven. And then very quickly you add the filling. With the help of a spatula fold the calzones. Another 10 minutes in the oven and that’s about it. Feel free to fill the calzone with whatever you like. The classic filling is mozzarella and tomato (which is what I did), but play around. 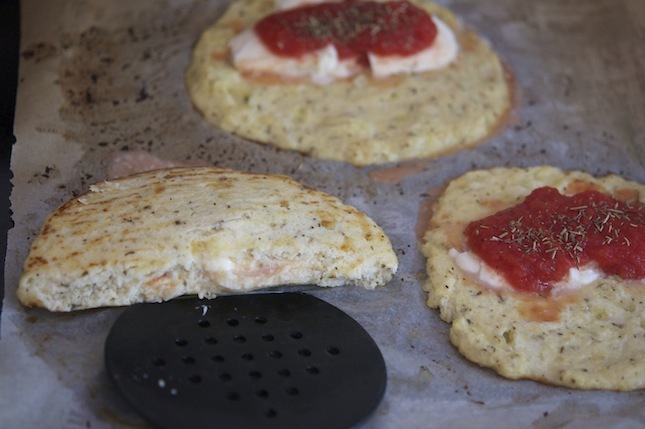 Cauliflower Crust Calzone Print this recipe! 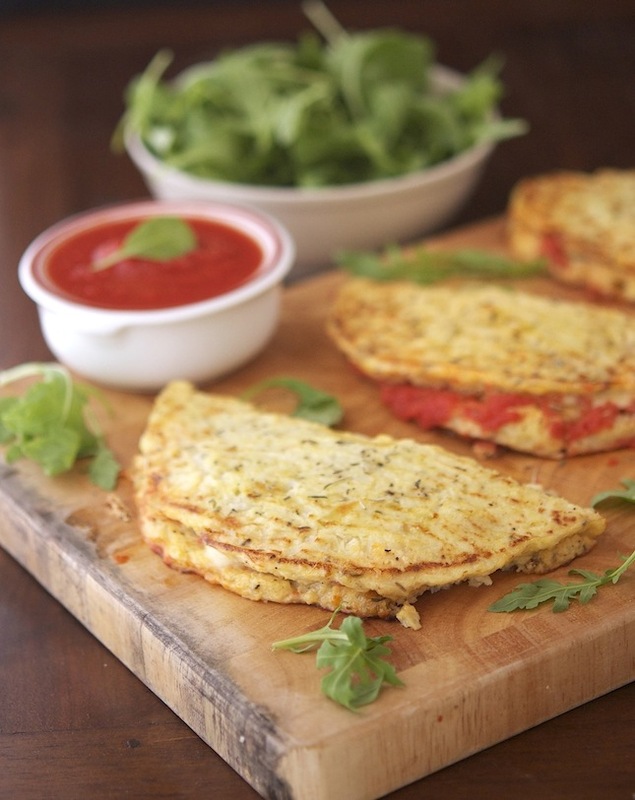 One cauliflower crust calzone yields 161 calories, 8.3 grams of fat, 8 grams of carbs and 11 grams of protein. OMG Mike looks amazing, I so have to try this! This is genius. I never even imagined it would have been possible to make a calzone with cauliflower crust. Thank you Mike for sharing this! This week I am avoiding wheat so this idea is just PERFECT! OMG Eduarda I'm on a gluten-free week as well, that's why I made these. Let me know how it goes! I want to make this right now! Amazing recipe. The pictures are great. I'm going to try a vegan version using flax seed meal instead of the egg. Hope it turns out good! Let me know how that goes Madhuram! HOw did the vegan version turn out? I wanted to try to make it! How did the vegan version turn out? I want to try it! Did you have luck with the flax egg? This looks delish and I'm vegan as well... would love to know if it worked. what can you make with these to make a meal, Im all about filling the tummy. so I am not hungry in a few hours. but i am dieting, and learning how to eat a lot better? This are an awesome idea. A lot like my Cauliflower tortillas but with a filling! Cauliflower tortilla? Sounds awesome. Gonna need to check those out! These* My spelling above was dreadful. 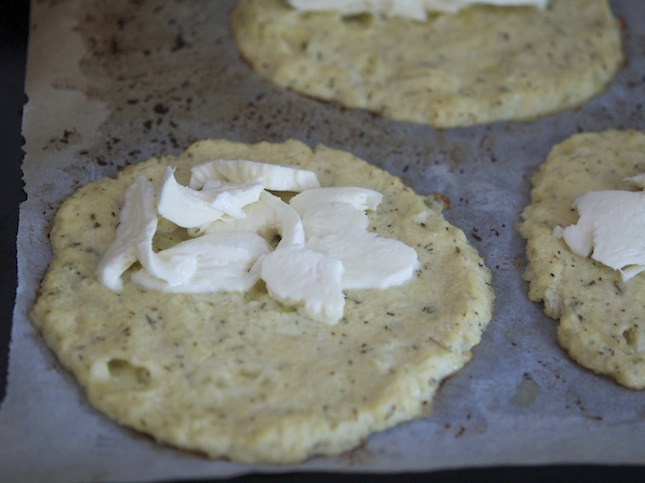 Now you had me wonder... you think these cauliflower crusts could be pan fried? I'll have to give that a try! Awwww Sonia you are truly the best! Hi! Brand new to this site...and I wish I had found it sooner. I am making my first batch of pan-fried cauli bread, and they seem to be coming out just fine, although I think it would be easier to make a large batch in the oven. Do you know if these freeze well? I don't have the time to cook every day, but I do like to make large batches and freeze things. Thank you for this fantastic site...I'm off to explore the rest of it. Will this still work without the mozzarella? I can't tolerate dairy. All I have is goat cheese. Would that work in place of the mozz for the crust? It might work, but I'm not sure. I'll definitely try in the next few days and let you know how that goes! I make something very similar and I use milled flax seeds instead of mozzarella in the mixture as I also can't tolerate dairy. It works out great. Cauliflower is awesome! I made this tonight, exactly as directed. I thought it was AMAZING but I forgot that I dont really like oregano. I still ate a whole calzone and dont feel full at all. I'm making them for my dad tomorrow, with less oregano, and I'm adding grilled onions, garlic and thinly sliced zucchini. So far so good. Thanks Mike!!! That's awesome Brooke, so glad you liked the calzone. And btw grilled onions + garlic + zucchini sounds like a great combo! I did exactly that, with less oregano and a little basil. My dad LOVED it and he loves absolutely nothing. I'm thrilled. This sounds really good, but I do not own a microwave. Is there any reason it wouldn't work to bake the cauliflower rice in a covered dish in the oven? The best option is to boil the cauliflower rice in water for 3 to 4 minutes. Drain it in a colander lined with a tea towel, and when it has cool off a bit, squeeze out all the moisture. 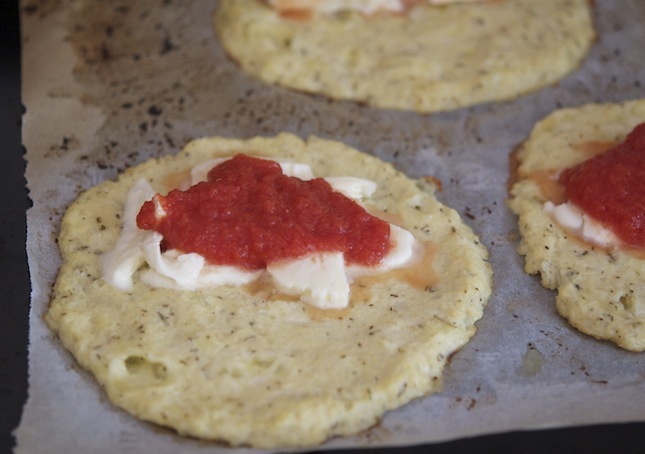 One of the readers used this procedure for making cauliflower crust pizza and was very happy with the results. Let me know how that goes Annette! This looks absolutely scrumptious! What a clever use of the famed cauliflower crust! I'll definitely be trying these. I made these last night: FANTASTIC!!!!!!!! I don't have a food processor. Any ideas on how to rice the cauliflower? I dunno if this relevant anymore but if anybody is going through the comment section and has the same prob, an other solution would be - tear up the cauliflower into florets, add into water and cook in the microwave/stovetop until soft. Mash the soft florets into a puree. Place in a towel/cloth and wring all the excess water out. I used your crust recipe exactly as written to make pizza. My toppings were a spiced tomato sauce (Italian spices, garlic and Sriracha sauce), bar-b-qued chicken, shredded mozzarella, black olives and shredded romano. I thought the crust would just kinda be there to support the toppings. Not at all. That crust is so tasty I can't imagine using flour for pizza crust ever again. I can't wait to try this! Thanks for the recipe. I saw you used fresh mozzarella in the calzone and was wondering if this was also the mozzarella that you used in the "crust"? Fresh seemed like it might not "glue" as well as the other. I will be so happy if this works well enough for me to give up the wheat crust. So far I have not found a suitable sub for pizza crust and just keep it as my guilty pleasure! I used fresh mozzarella, both in the crust and in the filling when I took the pictures you see in this post. Other times I used the "dry" type and I've noticed that since it release less moisture than the fresh, it "glues" better. However, in my experience, both works. I really hope you'll be able to enjoy this cauliflower crust, it's really the thing! Thanks for the reply Mike. I was hopeful that this recipe would give me the pizza that I love without the wheat bloat...and it did not disappoint!! To me pizza can not be eaten with a knife and fork...I have to be able to pick it up! I had a few struggles with this, but being an amazing cook myself, it gives me something to work with. Even though I squeezed all the moisture that I could out, and then put it all on a tray in the oven while the oven was preheating...it was dry when I mixed it up....but too moist after baking. I think my problem was that I put some olive oil on the parchment thinking it would help crisp the crust, and then the sauce I made was a bit watery. So the final product was a bit soft, but the flavor was OUTSTANDING!! We couldn't stop eating it! I was able to pick it up to eat, it was like a wheat crust that had gotten soggy. After eating pizza last night on a wheat crust and feeling like my whole body was going to explode...I am forever grateful for the ingenuity of this recipe!! I can't wait to experiment with it more. Thanks for your passion for great tasting and healthy food. Also...I forgot to mention...I steamed the cauliflower and then put it in the food processor. I don't use microwaves as they destroy the nutrients in foods...they actually change the molecular structure of your food and make it energetically very "chaotic". I wish more people would learn about this and give up their microwaves. It is sad to me that people go to great lengths to eat healthy food and then destroy all its benefits in a microwave. Mike I can't wait to try this!! Would it work if I left the "rice" out to dry for a few hours before making the crust? I love the ideas for toppings shared on here and am going to try this for sure tomorrow for supper! I'm not sure if leaving the cauliflower out to dry works. I fear that the "rice" will reabsorb the moisture and then release it when making the crust. Do the nutrition facts include the cheese and tomato filling? I made this today. I had a little trouble getting all of the liquid out of the cauliflower. The calzone had a more 'rustic' look to it, and was more moist than chewy. It still tasted wonderful, and I will attempt this recipe again. Thanks!! FYI...if you cook the riced cauliflower a little longer in the microwave, it gets rid of the moisture...first batch had tons of water to squeeze out...others, nothing! I think it all comes down in not squeezing enough moisture out of the cauliflower rice. It's the one thing that makes a whole lot of difference. As mentioned in the recipe the cauliflower rice should be dry before making the dough. Hope you'll have better luck the next time! I followed the recipe to the letter and the calzone came out AMAZING! I have no words to express how good they were. Definitely going to make this over and over again. Thanks for the advice about boiling the rice mixture! As I do not use a microwave. I made this and suggest that you heavily grease the parchment paper before you put the cauliflower on it. I only lightly greased it and it stuck like crazy. Tasted great but was a mess! Oh gosh Tami, sorry to hear that it stuck like crazy. It never happens to me, and I make a cauliflower crust (pizza or calzone) weekly. Could be the parchment paper you're using? I'm going to add a note to let people know that this may happen. Would a Silicon baking sheet be OK? It works well for most other things I bake. Never sticks and things usually crisp nicely. Made this last night for dinner: SOOOOOOO YUMMY! Great recipe! I never would have thought to use cauliflower like this. My crust turned out perfect. I followed the instructions letter for letter with a few exceptions. I didn't have a food processor so I had to rice the cauliflower using a grater. I used cheesecloth to drain the cauliflower. I stuffed it with cheese, sauce, fajita chicken and steak, sautéed onion and mushrooms. It was wonderful!!!! Such a great idea to stuff with fajita chicken, mushrooms, onions and salsa. I bet it was delicious! YUM! It turned out great! I cut the recipe to just make one for myself. I think the crust tastes better than wheat/yeast crust! Definitely will make again. That's awesome Olivia, I'm so happy you enjoyed it! Ok, instead of mousse, I tried out this recipe and it was superlicious! I never thought Cauliflower can be this good! Thank you so much for sharing it! I don't have microwave, what would be an alternative to heat the cauliflower rice? boiling it? thanks! I don't have a food processor. Do you think it would work to use a magic bullet? Absolutely, magic bullet works just as well. You might need to process it in batches though. The carbohydrate amount listed...Is that net carbs? If not, how many grams of dietary fiber is a part of that? 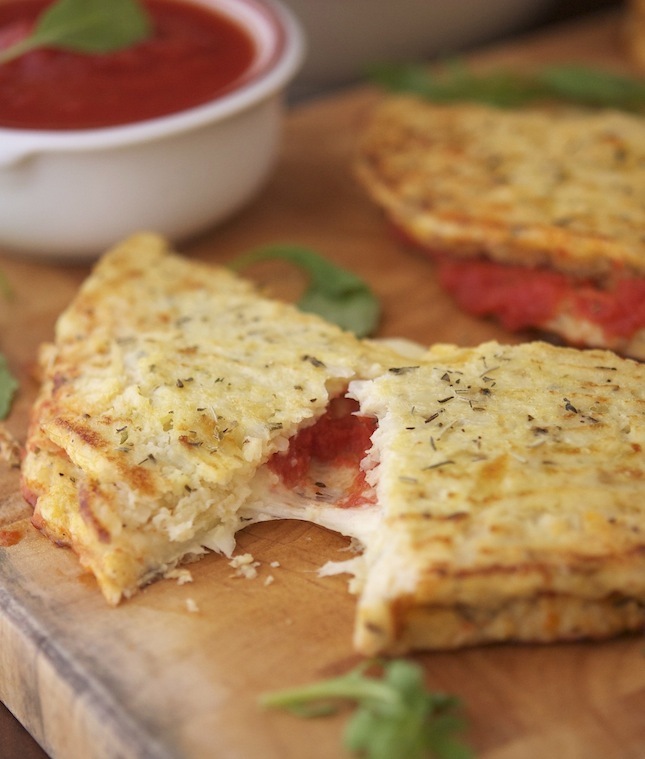 Love Cauliflower crust pizza and this looks awesome- never thought to calzone it! Cheers mate! Like hundreds of people. Read the comments above! could you just leave the rice out over night to dry it out as opposed to squeezing out the moisture with a tea towel? I made this last night for dinner. DELICIOUS! Thank you. This looks yummy. I'm heading into a non guten,non dairy elimiation die butI' hoping I'll be able to add back dairy and make this recipe. Any thouhts on what else to use as the glue if I can't eat cheese? I think the cheese is more for taste. The egg is more the binding agent. Never tried without cheese though. As a celiac, I get giddy about "gluten alternatives" THANK YOU, THANK YOU, THANK YOU!!! I cant wait to make these! I will be making them with Egg replacer as I am allergic to egg also. You should try using flax eggs, many readers were very happy with it! I really enjoyed the taste. Apparently I was not "liberal" enough with the oil. It took some effort to get them off the parchment paper. Yes, you need to grease that parchment paper but I've also found out that the quality of the mozzarella you're using can make quite the difference. Provided that you have squeezed the bejesus out of the cauli rice! These were delicious. I made them with mushroom garlic and leeks inside, and just with tasty cheese as that was the only cheese I had on hand. Absolutely amazing. That's awesome! Garlic and leeks sounds like a great flavor combo. I should deffo give it a-go! This may be a silly question, the recipe says 3 cups of cauli rice. Is that 3 cups of cooked & already wrung out rice...or 3 cups of raw uncooked rice (which will shrink down after cooking)? Reason I ask is once the rice is cooked, 3 cups raw shrinks down to under 2 cups cooked for me. Thanks! My understanding is that parchment paper is slightly thicker with a non stick coating on it. Grease proof paper is thiner with no coating. They are usually interchangeable but parchment is better for non stick baking, etc. These are the first cauliflower crust I've had turn out for me, and I've tried a couple! They sure didn't disappoint either! My question is has anyone ever refrigerated then reheated? I'd love to make them up ahead and have them for lunch, reheated in the oven or a skillet is what I was thinking but wasn't sure if it would work out or not. If you check some of the comments above you'll find that many readers have succeeded in freezing and reheating the calzones in the oven. 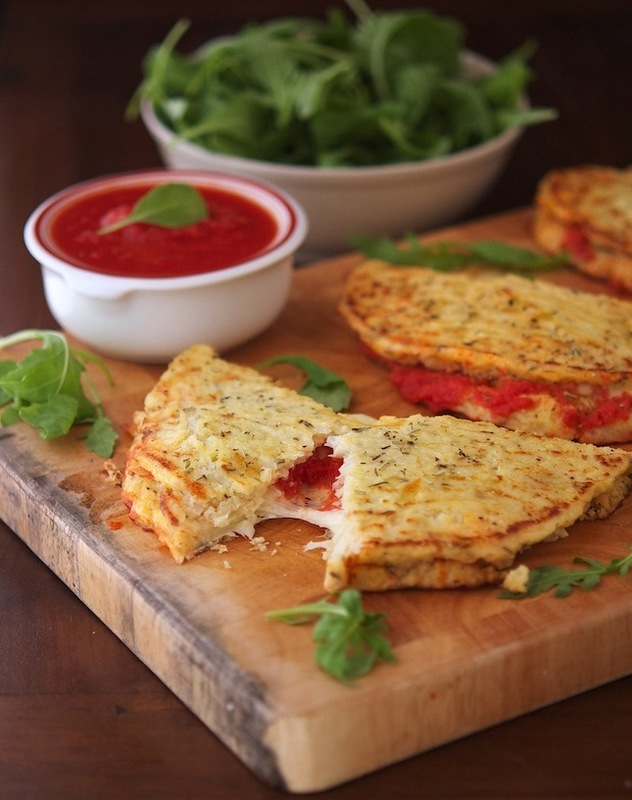 This Weekend I would like to try one of your cauliflower crust recipes, they look delicious! I don't have a microwave at home, is it possible to bake the cauliflower in the oven instead of the microwave? I recommend either steaming or boiling the cauliflower rice. Afterwards be sure to squeeze out all of of the moisture from it! Tried these last weekend and needless to say making them for dinner again tonight! Delicious recipe, a keeper for sure! All around, thanks for the great recipes - much appreciated! Thank you so much Gretchen, I'm psyched you enjoyed my recipes that much! I will definitely be using this as a stuffed cauliflower crust recipe.. so calzone-esqe because OHMYGOSH how have I not heard of this before!!! Awesome Padmajha, I'm going to check it out right now! I am lactose intolerant but successfully made this recipe without cheese in the crust (just add more cauliflower) and I made a white sauce (with lactose free milk and vegetable stock powder ) to put inside to give the illusion of melted cheese. Thank you for such a fantastic recipe. I can't get enough of it. That's a great option for all the lactose intolerant or for those who wish to keep it dairy-free. Thanks for letting me know, I really appreciate it! Holy cow, I made these last night. So delicious. Thank you for sharing your work with us! Ok. I made these! They were amazing!!! I made homemade sauce and filled the crust with that and sauteed onions and mushrooms then added some mozzarella cheese. UNREAL. So good. Thank you. I made these tonight and they were delicious!! Couldn't believe how the crust turned out so similar to regular pizza crust. But I will warn you, do NOT believe the lie that these are "not complicated to make" or "really quick" to make - both of those are FALSE! It takes a long time and a LOT of work to make these. You have to chop up the cauliflower, puree it in batches, microwave it in batches, and weirdly try to squeeze liquid out of it while it's still burning hot. And even in the oven, it takes over twenty minutes to cook! Hello, not super fast or easy at all! If I ever make it again, I will not process the cauliflower but instead just chop it up as that is much faster for me. I will also cook it in the oven or on the stovetop so that the moisture comes out while it is cooking, instead of trying to microwave and then squeeze it. I found that method on you tube as well. I do this when I buy the cauliflower and usually end up with a few 14 ounce jars of riced cauli ready to go into recipes for the week! Can you use frozen cauliflower for this recipe?